This article was published in B.D.A. Dyslexia Contact magazine, January 2014.
by Abi James, New Technologies Committee Chair. The Wizcom Exam Pen is a version of their Reading Pen. This special edition has been produced to comply with the latest Joint Council for Qualifications (JCQ) exam access arrangements. This now allows the Exam Pen to be used to support candidates who are able to use the “Read Aloud” arrangements, or for those who qualify for a human or computer reader (including in exams that assess reading). The Exam Pen unit is shaped like, and held similarly to, a pen. The nib end consists of 2 rollers and the scanner. The pen is moved over printed text like a highlighter pen, with the text aligned between the 2 rollers. The word (or words) then appears on the screen and is read aloud with a computerised voice. The voice is heard through the in-built speaker, or by connecting earphones (supplied with the pen). To enable its use in exams, the Exam Pen does not provide any dictionary definitions, or save scanned words. 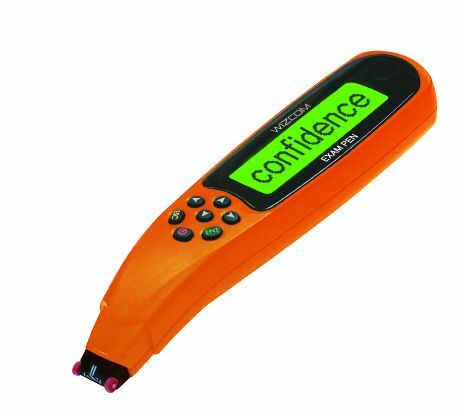 The option of using an Exam Pen in assessments may provide a discreet solution for some candidates who would need assistance with recognising words. However, as it relies on scanning and recognising text, there is a risk that not all words will be recognised and spoken correctly. Therefore we would recommend that it is only used by candidates who need to check the odd word or phrase, and are able to recognise if the word is scanned incorrectly. It is also very important that candidates practise with the pen on past papers, as it can take time to develop the correct method of scanning accurately. The pen comes with a training guide and a foot which fits to the nib of the pen and aids with correctly positioning. It is particularly important that pen nib is kept upright and is moved over the text in a consistent speed. It is also helpful to start scanning from the end of the previous word, so that the scanner picks up the blank space and the beginning of the word to be read aloud. The Exam Pen is available from Scanning pens for £190 per pen.